DIABLO – Spring is here and with the change in seasons, comes work to start clearing State Route 20/North Cascades Highway. Washington State Department of Transportation maintenance crews will begin clearing the scenic highway on Monday, March 26, from the Diablo side of the gate. On Monday, April 9, crews from the eastern, Mazama, side will start working and the two will eventually meet in the middle. This process usually takes four to six weeks but can last longer if spring snow falls or go faster if warm spring temperatures speed up snowmelt. Once crews clear the snow, they’ll need to assess the road for any winter damage, replace guardrail and signs that were removed during the closure and clear areas of rocks and other debris. Once that work is complete, crews will open the gates to vehicle traffic. 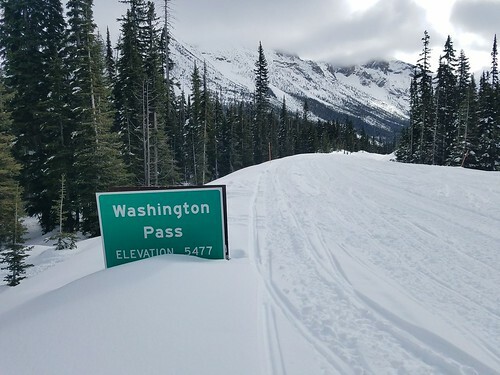 During a March 20 assessment trip, WSDOT avalanche and maintenance staff found nine feet of snow near Rainy Pass and deep snow levels on Liberty Bell avalanche chutes. Crews will watch the snow pack on some avalanche chutes that could slide as spring temperatures increase. In other areas, there is less snowpack than we often find, which could help in the clearing process. Access between the gates is allowed during the winter months but during the Monday through Thursday clearing process, the area is closed to everyone but maintenance crews due to heavy equipment being used in the area. Follow the reopening process on the North Cascades Highway webpage, on the WSDOT Flickr account or through the WSDOT North and WSDOT East Twitter pages. Last year crews started clearing on Monday, April 10, and reopened the highway on Tuesday, May 16. The latest opening was in 1974 when the highway reopened on June 14. During the winter of 1976 to 1977, there wasn’t enough snow to ever close the highway.